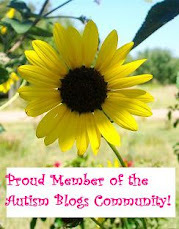 First, I'll be doing the 2012 Walk for Autism Delaware again this year! 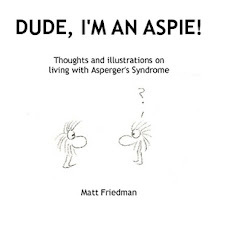 Last year I raised $463 for this cause, with the help of many of my readers! This year, I'm teaming up with my friends at Juniper Hill Farms. 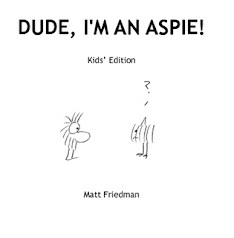 Help us reach our goal when you support us through the Dude, I'm an Aspie fundraising page! The April 21 walk will benefit adult vocational services, teen game night, parent information, and autism awareness and education. Thanks! And lastly, don't forget I have T-shirts! There are five designs now, including "I Need a 1-Up!" 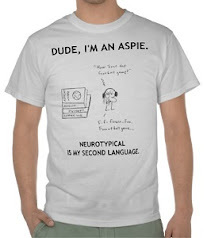 and "Neurotypical Is My Second Language." Is there a cartoon you'd like to see on a shirt? Tell me, and I can probably make it happen. oh man, I forgot how much I found myself nodding to the "wide eyed" cartoon... I had just gotten a new monitor and yeeeeeeeargh! I know, I forgot myself, since I've now gotten so used to it! *Squee! * It's a shirt now!! Yays! I know it's not much costwise, but I still have to wait till I get the money... oh, but it'll be worth the wait! Another smile in my odd days of late. I hope you don't get tired of me "sounding" like a broken record (no vocal involved, so no sound, right?)... but I feel so blessed to be able to come here and find something to make me smile, even if it's something I've found a hundred times before! Best of luck on the walk! Hope you break your fundraising record! Hey Chris - nope, never gets old to hear I make others smile - thanks!